According to the press release, Philips' Brilliance Lightframe monitor "stimulates your visual senses for improved concentration and promotes an overall feeling of well-being." How is it supposed to do this? 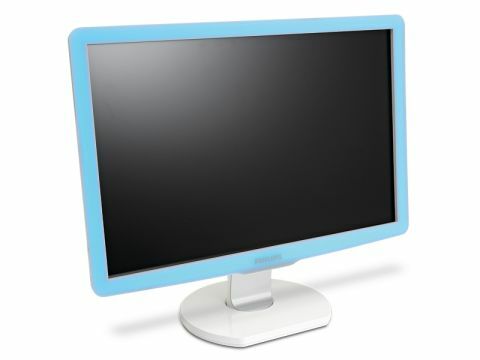 Simply put, the monitor's bezel has a blue light-up surround. It's a bit like the company's Ambilight televisions, only the colours don't change. Has it at all improved my concentration or promoted an overall feeling of well-being? Well, I'm writing this review on a machine with a normal monitor, and yet I'm constantly distracted by the giant glowing blue thing to my right, as if it was Dr Manhattan's dangly bits. So no, you couldn't really say my concentration has improved. In terms of well-being, imagining Dr Manhattan's luminous member in my peripheral vision is making me feel a little uneasy. Philips' other grand claim is that it reduces eye fatigue. This isn't an ailment I've suffered from, simply because I don't ever look at anything that doesn't have a screen on it. If I was constantly switching between looking at my PC and trying to identify the pilot of a passing jumbo, I might suffer from eye fatigue, but currently it doesn't affect me. The blue surround of the Philips monitor is cool enough though, and I'm guessing the colour was selected because it looks like sky on a sunny day. It's as if Windows 7 had become a rectangular, static cloud to frame my desktop. The panel (or interactive cloud) is absolutely glorious to boot. Philips has included SmartImage, which uses digital signal processing to make the colours look just right, and apparently this increases the contrast ratio to a whopping 12,000:1. I tried FEAR 2 – possibly the blackest game there is – and all the different shades of grey were properly identifiable, right down to the hues on that especially freaky chick's bumcrack. There's a dinky little button with which you can set the colour scheme to the environment you're working in: Office Work mode dims the screen a tad, Image Viewing and Entertainment modes enhance the contrast, and Economy mode is suspiciously similar to Office Work mode. It's certainly handy being able to switch between them at the press of a button. The Brilliance Lightframe comes in at about £50 more than other similarly-sized screens, and it seems like quite a premium for something you could achieve by setting your desktop background to sky blue and shrinking your windows. But that's beside the point, obviously. I'm not convinced that it would work for gamers though. Maybe if Philips creates a monitor that makes it look as though flames are creeping up the side of the screen and the devil himself is about to come crawling out, then it may well be worth considering.